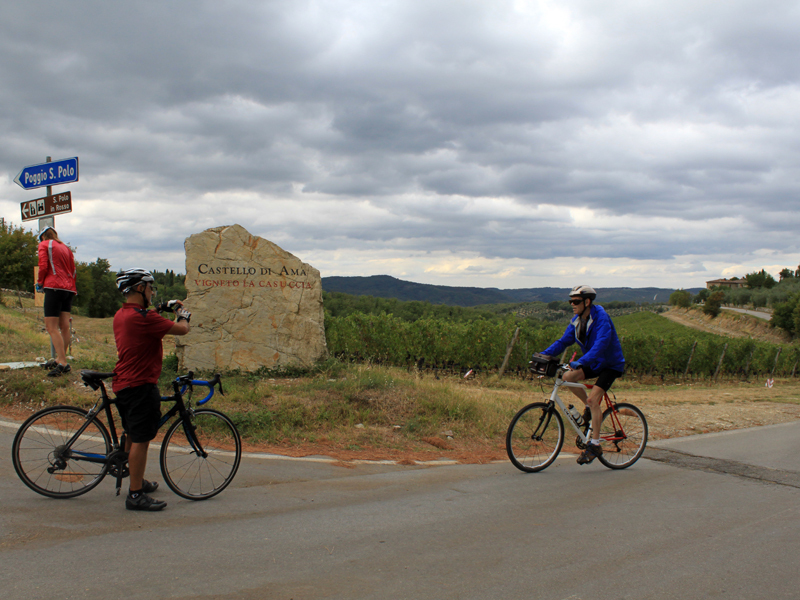 Welcome to the bike trip combining fantastic moderate bike rides and cooking lessons, special tasting: olive oil, wine and cheese. Of course is la cucina Toscana – simplicity in its purest form. 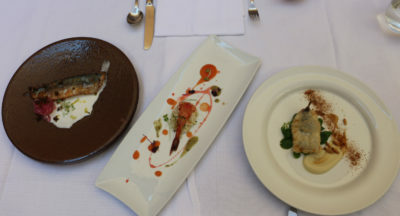 Tuscany cooks take advantage of the freshest seasonal products and tamper with their natural state as little as possible. The cooking and the cycling aspects will please anyone who has a strong interest in one or both of these great passions. In italy a genuine meal can tell the story of our culture. 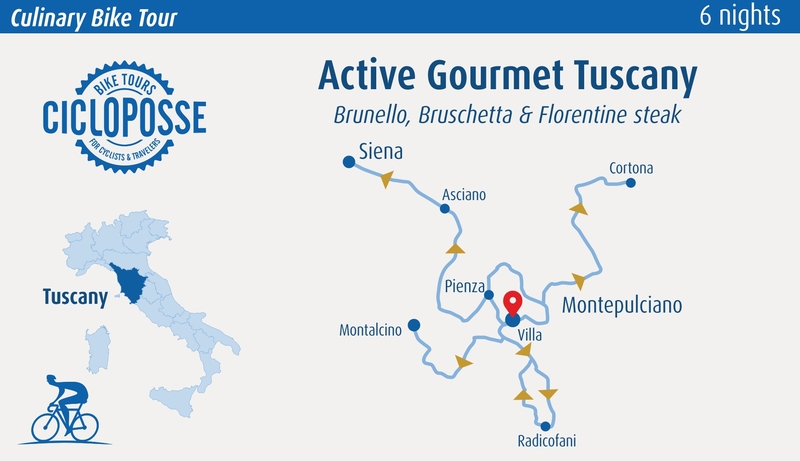 A variety of bike rides pursuits get you deep into some of the world’s most iconic and famous landscapes, while a sampling of food and drink experiences keep your mouth watering as you dig into the real way Tuscan people eat. Return from your trip with actual know-how to create a Tuscan dinner back home—it’s the ultimate keepsake! 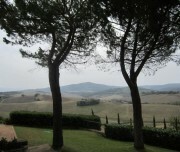 Private van transfer to the country house Palazzi del Papa , 14 km /9 miles from Pienza. Check in at your room and let’s start bike fitting session and meet your guides. After all guest are set with bikes and equipment let’s have a very short bike ride test in the valley. 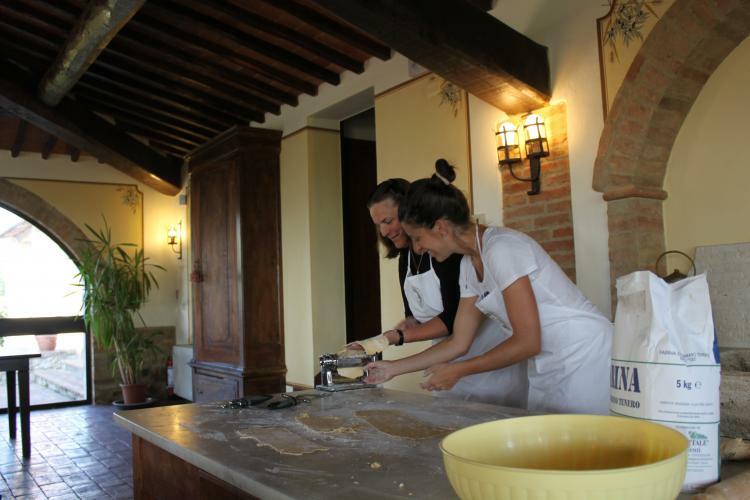 Ready for your first cooking session with Paola – perfect way to build the team. 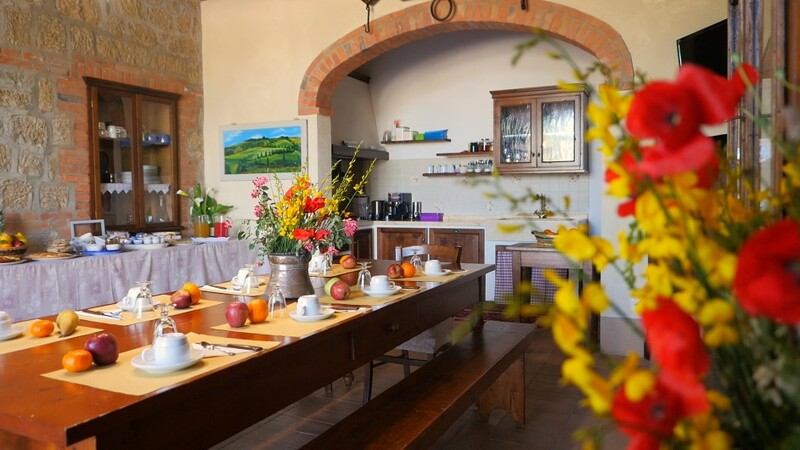 After welcome breakfast ready to start – a short transfer by van just outside Montepulciano village to let you start the first ride with a nice gentle downhill through the vino nobile vineyards. 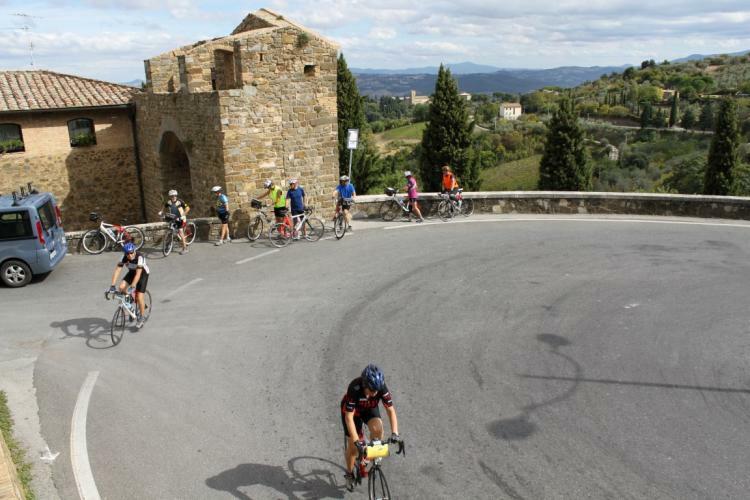 After will be flat terrain: the Val di Chiana, once a swampy lowland, except for the final climb to reach the old town on the hill Cortona, one’s of Italy's oldest towns. The first set of city walls were built by the Etruscans in the 4th century BC. It became famous by Frances Mayes in her bestselling book “Under the Tuscan sun” also a movie!! Stroll the winding narrow - and steep! - medieval streets for a while. Transfer back to the country house by van in the afternoon, for stronger cyclist option to ride back! Dinner in Monticchiello at La Cantina della Porta. 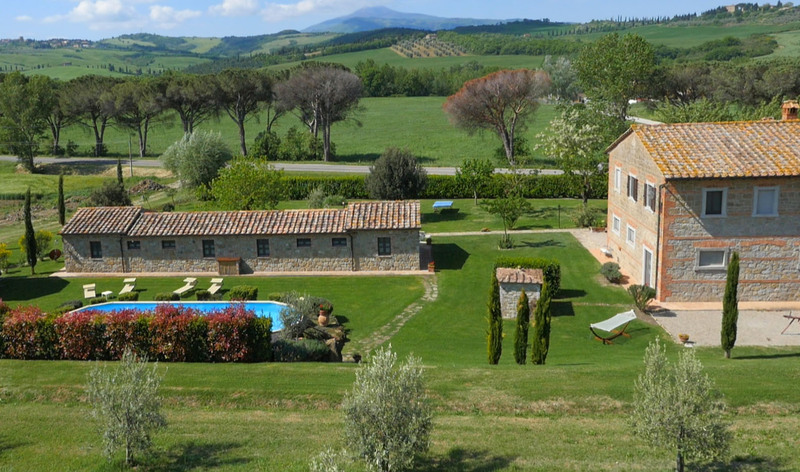 Our ride today starts from the villa - First stage is Pienza, a pristine Renaissance jewel created in 1458. Pope Pius II chose the famous Florentine architect Rossellino to transform his home village of Corsignano into one of the few examples left of 15th century architecture. 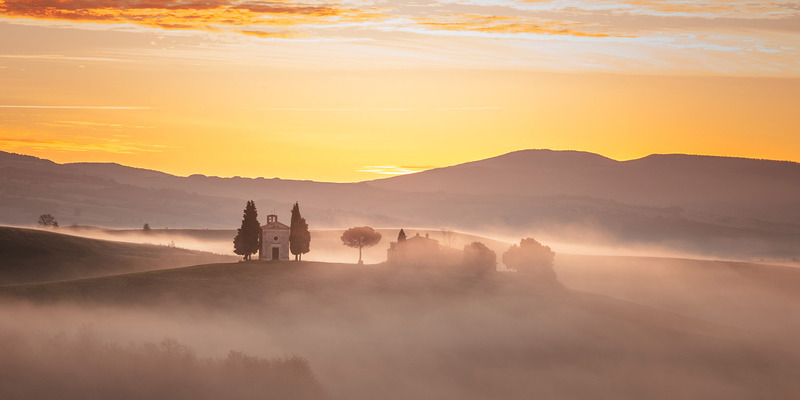 The main product is the pecorino the delicious pungent cheese made using only sheep milk – continue to next village Montepulciano known as the Pearl of the Sixteenth Century. After the lunch at la Porta di Bacco where our friend Andrea will show the Etruscan caves, let’s go to have a wine tour at Cantine de Ricci and explore underground wine cellar. This Cantina not only is it right in the center of town just off Piazza Grande, it had been dubbed "the most beautiful wine cellar in the world." It is also called the Cathedral of Vino and you'll quickly understand why. Back in the saddle last stop in the village of Monticchiello, the quintessential Tuscan hill town. 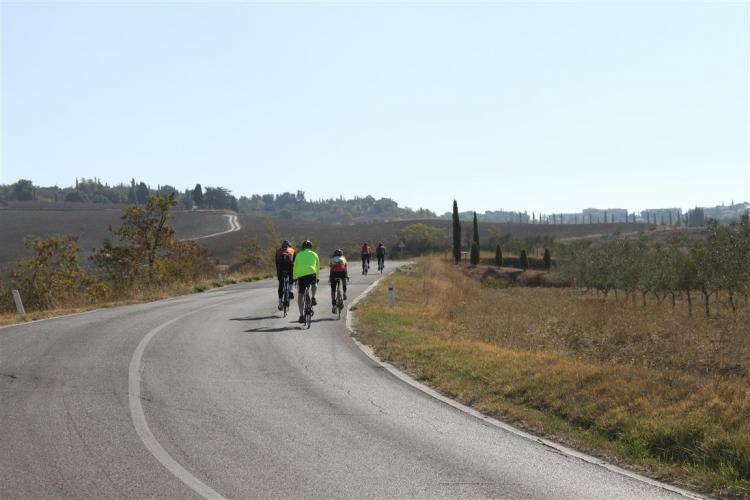 Bold cypress trees line our route to the Orcia valley where you bike through the fields that inspired Renaissance painters. Our ride start from the villa: first stop after 10 km easy ride is the ancient Roman spa of Bagno Vignoni. Legend has it that Saint Catherine and Pope Pius II both bathed in the thermal waters here. It is a tiny village, water has a constant temperature of 51 degrees Celsius, at the heart of the village is the "Square of sources", namely a rectangular tank, of 16th-century origin, which contains the original source of water that comes from the underground aquifer of volcanic origins. This afternoon let’s learn the classic pasta of the area: pici all’ aglione sauce and pici al ragu di chianina. 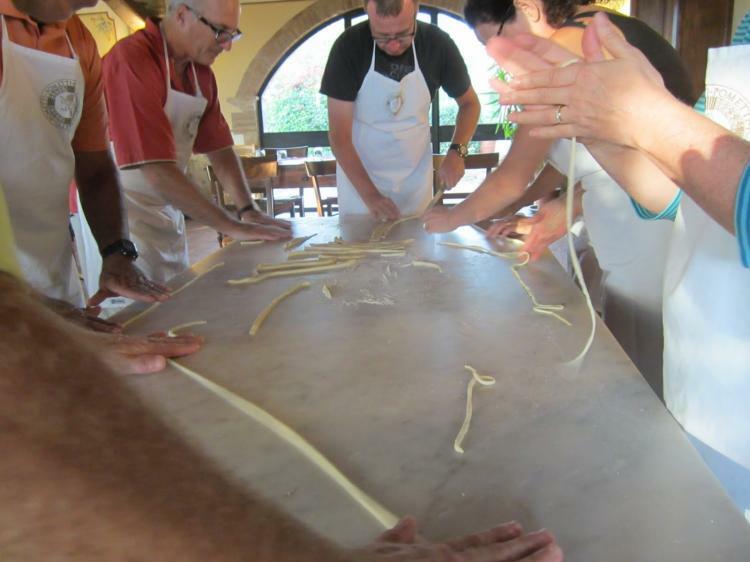 Pici is a fresh spaghetti, handmade one by one. On request we will arrange transfer at different time. 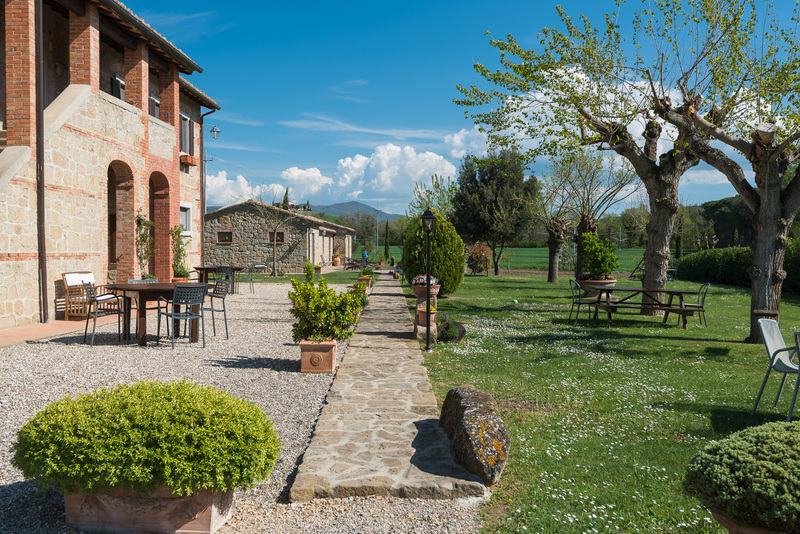 The Palazzi del Papa farmhouse was built in the thirties by the Marchesa Origo - La Foce - replacing an old inn where the Eminences used to rest when they were going through the nearby Francigena road. 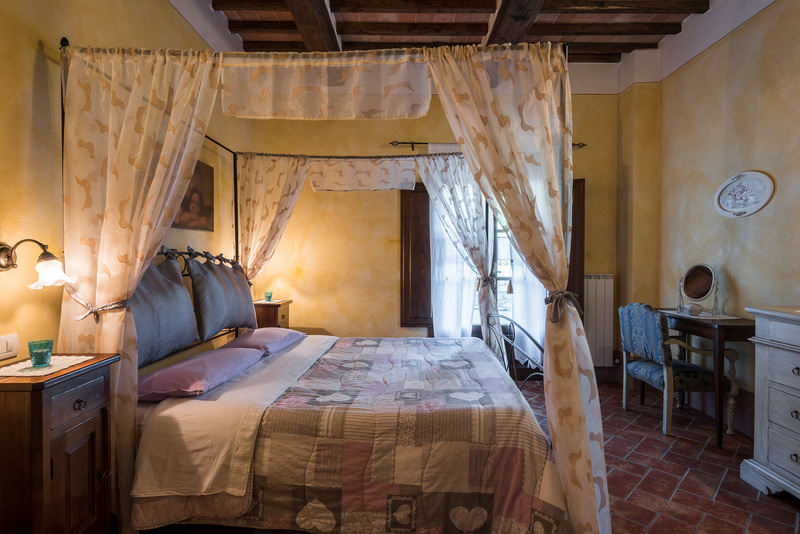 Furnished with rustic antiques, the country house has a warm atmosphere authentic Tuscan charm. Nowadays, the Company owns 100 ha cultivated with cereals and wheat which is mainly used for the Chianina-breeding. This activity is, among others, the most important one. From the vineyards a wonderful red DOC Orcia wine is produced. Of course, it is available to be tasted for all our kind guests. 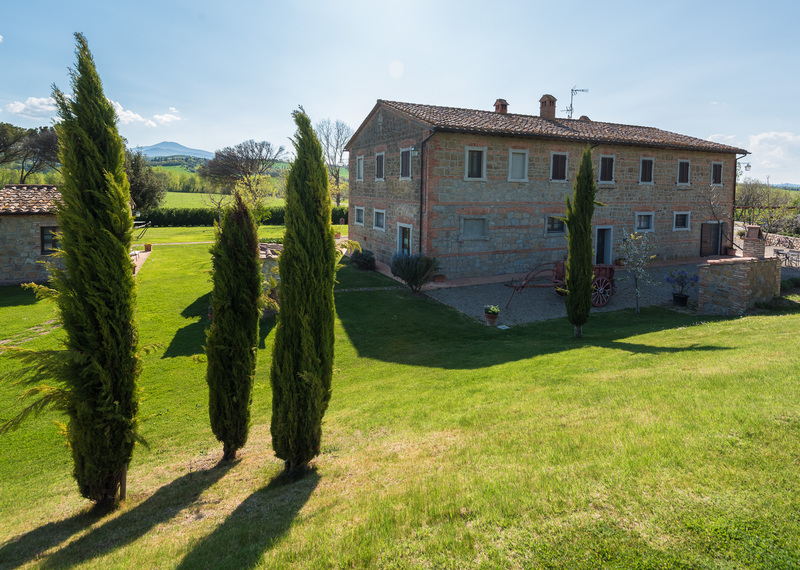 They produce wine, olive oil, Chianina meat. 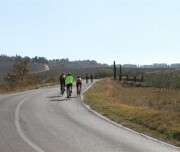 Blaine and I wanted to write you a quick note to thank you for hosting us on our recent Active Tuscany Cycling Adventure. 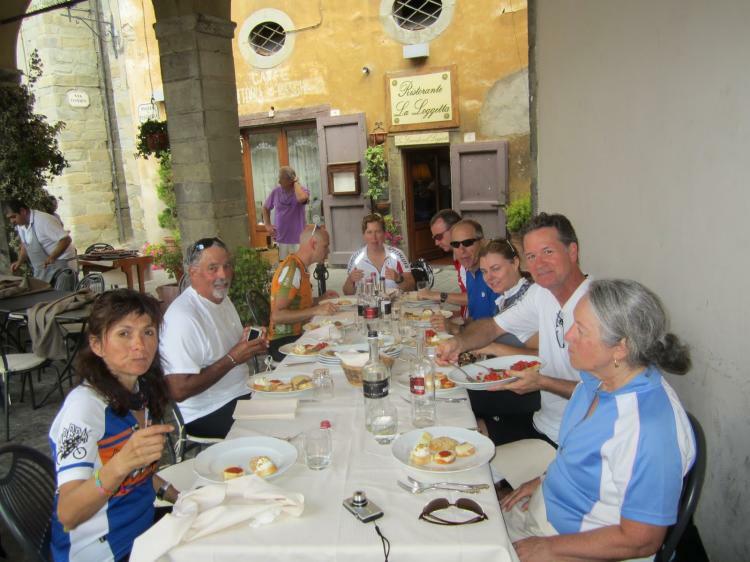 Everything about the tour was exceptional from the towns in Tuscany that you selected us to ride, the restaurants that you selected for our dining and of course the professional chefs you had for us to learn the secrets of Tuscan Cooking!…. As you know, we thought Sabrina was beyond AWESOME! What an incredibly genuine and lovely women. I smile every time I think of her….so very precious! Paula was an exceptional chef and now whenever I cook pasta, I hear Paula in my head explaining the “Tuscan” way to cook pasta….so delicious! Gigi was a great cycle leader who did a super job having 6 riders all at different levels of fitness, experience and bikes. I can only imagine how challenging it is to get everyone to the same place, on-time without injuries….although I am sure we frustrated him (from time to time) he was always professional and guided us with his immense skill and expertise. Andrea for only being with you a short time was so incredibly personable. What I admired most about Andrea is his ability to show initiative and his thirst for learning….learning about driving, bikes and always wanting to ensure that he was speaking grammatically correct english. Very impressive young man! We also had the opportunity to dine on our last evening with your son who represented your company very well with his keen personality. Lovely young man! Giuliana, you are the glue that holds all of this together and I want to thank you for your guidance and expertise. 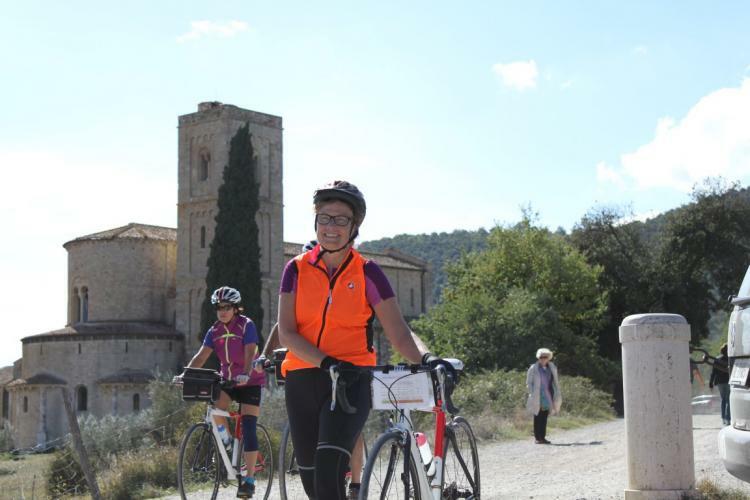 Giuliana, you are a gracious host with a fantastic personality that made our adventure with Cicloposse the best cycling trip we have ever been on! Thank you! We look forward to cycling with you again. 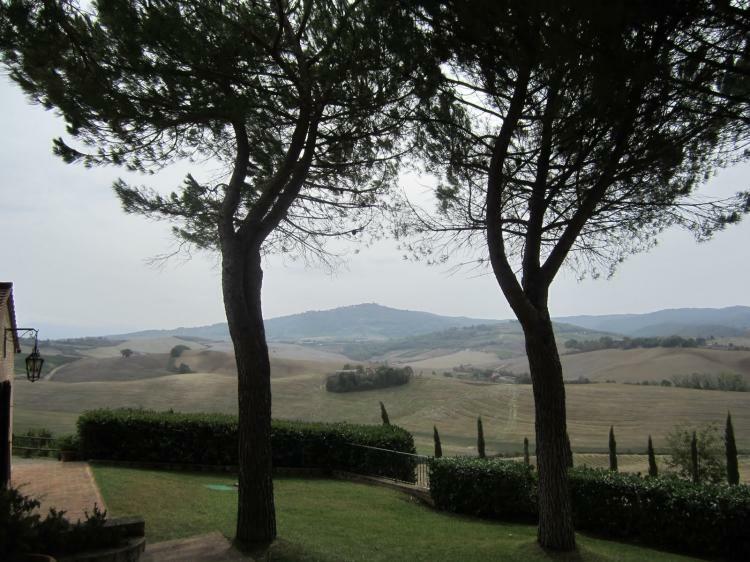 Giuliana and Marco Wanted to thank you for a fabulous time in Tuscany. 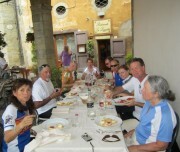 Jeff’s first trip to Europe and my first to Tuscany was made fabulously memorable and that is thanks to you both. We were so pleasantly surprised by the accommodations, by Duccoi, his family and staff and by your professional yet fun expertise and by everyone who helped make our experience so enjoyable. We will be return customers – guaranteed! (keep us in mind for Croatia for next September!) Gracie once again – Arrivederci fino alla prossima Volta! We had a absolutely fantastic time. I expected the riding to be great but had no idea all the rest of it the week would be so wonderful. Boscarello is beautiful, of course, but in addition Carlotta was a wonderful hostess and it was exciting to meet her father as well. The food was delicious — we’re still remembering and talking about the recipies! You and Marco were absolutely the best! All the riding details we so well thought out — we loved the restaurants and the visits. It was perfecto!! Thanks very much for everything. We really look forward to doing it again!